The Cubs retire the first number in franchise history: #14 in honor of Mr. Cub, Ernie Banks. 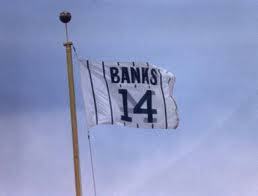 No-one had worn #14 since Ernie retired as a coach in 1973, but by raising the #14 flag the Cubs make it official. In the lineup for the Cubs that day is a rookie third baseman named Ryne Sandberg, who would have his own number #23 retired by the Cubs almost exactly 23 years later. While Ernie was the last Cub to wear #14, he obviously wasn’t the first. Some big names in Cubs history also wore it, including pitchers Guy Bush (1932), Charlie Root (1934) and Larry French (1935-1941), and the eccentric Lou “the Mad Russian” Novikoff (in 1942). The last person to wear #14 before Ernie was a little known player named Paul Schramka. He appeared in exactly two big league games in April of 1953. On Opening Day he came in as a pinch runner, replacing catcher Clyde McCoulough. He didn’t score. Two days later he came in to replace outfielder Gene Hermanski in left field. The ball was never hit to him. A few days later he was sent to the minors. Ernie took over the number that September. Over the next two decades while Ernie Banks made a name for himself in Chicago, Schramka lived in the Milwaukee area, and worked in a slightly different field. August 20: In 1961, Don Cardwell pitches an 11-inning six-hit shutout to defeat the Pittsburgh Pirates. Billy Williams knocks in the winning run in the bottom of the 11th…In 1971, Fergie Jenkins wins his 20th game of the season, 3-2 against the Houston Astros. Fergie will go on to win the Cy Young Award. August 21: In 1954, the Harlem Globetrotters beat George Mikan’s U.S. All Stars 57-51 under portable lights…In 1958, Ernie has a big day, hitting two homers and a double in a Cubs win against the Pirates. He knocks in all five Cubs runs…In 1968, Billy Williams drives in nine runs in a double header sweep of the Braves, including seven in the second game…In 1975 Rick and Paul Reuschel become first brothers to combine on a shutout in Cubs’ 7-0 win vs. Dodgers. August 22: In 1930, the Chief Justice of the United States Supreme Court, Charles Evans Hughes, is in the audience for a 12-4 Cubs win over the Giants at Wrigley Field. Hughes is a Giants fan and probably doesn’t appreciate Gabby Hartnett’s grand slam home run…In 1936, before the Cubs-Reds game, a group of amateur players play an exhibition in old-time uniforms with old-time rules to celebrate the 60th anniversary of the National League. The Cubs lose the actual game 6-4…In 1942, Clyde McCullough, Lennie Merullo, and Phil Cavarretta pull off a triple play against the Reds. Bill Nicholson hits a walk-off homer in the 11th to win the game…In 1982, the Cubs retire Ernie’s #14 in a pre-game ceremony (full story above)…In 2001, Sammy hits three homers and the Cubs win 16-3. August 24: On this day in 1936, Cubs shortstop Billy Jurges gets into a fist-fight with Gilly Campbell of the Reds after a hard slide into second base. Jurges punches Campbell in the face and is ejected. Cubs win the game in the bottom of the tenth on a hit by Augie Galan…In 1958, future Cubs manager Jim Marshall has his best day as a Cubs player, hitting three home runs in a double header against the Phillies. The Cubs lose both games…In 1971 Ernie Banks hits his 512th and final career home run in Cubs’ 5-4 loss vs. Cincinnati. August 25: In 1922, the Cubs beat the Phillies 26-23 in the highest scoring game in Major League history. Cliff Heathcote goes 5 for 5 with 5 runs scored and four RBI. Charlie Hollocher knocks in six. Hack Miller hits two three run homers. The Phils score 14 runs in the last two innings to make a game of it, but amazingly none of their 23 runs score on a home run. The two teams also combine for nine errors. August 26: In 1930, Hack Wilson sets the National League home run record with his 44th home run of the season. He will end the season with 56, a record that will stand more than sixty years…In 1936, Bill Lee wins his 15th game in a row at Wrigley Field, a 4-2 Cubs victory over the Phillies in the first game of a double header. Ethan Allen is the hitting star for the Cubs. He will later become the head coach at Yale, and coach future president George H.W. Bush…In 1962, the Cubs bunt in four consecutive at-bats in a 4-1 win over the Braves…In 1972, Ron Santo hits two homers and drives in four in a Cubs 10-inning win over the Giants. Jose Cardenal scores the winning run when Joe Pepitone is hit by a pitch with the bases loaded. 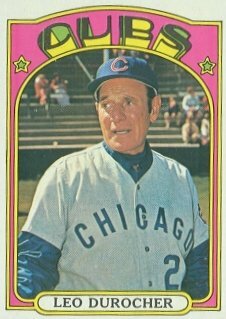 Cubs manager Leo Durocher completely loses his composure in the clubhouse, and in so doing, may have lost his team forever. It happens before a game against the Cincinnati Reds. The Cubs are 11 games over .500 and only 4 1/2 games behind the first place Pittsburgh Pirates. But Leo is still upset with pitcher Milt Pappas. The previous game he had allowed the winning run in a 4-3 loss when Doug Rader hit an 0-2 pitch for a double. Leo calls a club meeting and rips Pappas for his stupidity. After his little speech he opens the floor for comments. Joe Pepitone is the first one to defend Milt. He says: “He didn’t want to do it. Why are you always blaming people?” Ken Holtzman and Pappas also speak out, ripping Durocher. That’s when Leo loses it. He tears into every player on the team in a legendary expletive filled tirade. Among those he rips is team captain Ron Santo. He says that Santo is a malingerer who plays politics with the front office. Among his charges: Santo is pouting and demanding a Ron Santo day. That’s when Santo loses it. He calls Durocher a liar and has to be physically restrained by his teammates. The Cubs somehow go out and win the game, but afterwards they spiraled into a deep losing streak. They lose 16 of their next 21 games. Cubs owner Phillip Wrigley doesn’t speak up about the dispute until a few weeks later, but when he does, he leaves no doubt where his loyalties lie. He takes out a full page newspaper ad praising Durocher. Ernie retires a few weeks later. Leo is gone by the middle of the next year. And the Cubs don’t register back-to-back winning seasons again for more than 30 years.